The legal world can be competitive. That’s why it’s crucial that you stay on top of your game. An excellent way to make sure that prospects notice you is to develop a site for your practice and show people that you have what it takes to take their case and win. Because of WordPress and a hundred of other themes specifically designed for lawyers, creating law firm sites are easy. However, to stand out from the rest of the pack, you have to have a website with a great user experience design as it can increase your site performance and generate leads. How your site looks and feels is important. Chances are, most users won’t come to your site to check out how slick it is. Instead, they’re coming to your site to complete an action or to find crucial information. Therefore, adding unnecessary design elements, (or elements that serve no functional purpose) makes it harder for site visitors to accomplish what they have to do. Therefore, for a UX perspective, simplicity is your friend. Colors– Don’t use too many colors. According to a source, use only a maximum of 5 (plus or minus two) in your site’s design. Typefaces– The typefaces you should select should be legible. Also, when it comes to colors, don’t use too many. Ideally, a maximum of three fonts could be used in a maximum of three different sizes. Graphics– Only use graphics if it helps a user complete a specific task or perform a function. You need to organize the elements of your site so that users tend to gravitate on the most critical aspects. Note that when you’re optimizing for UX, your goal is for your lead visitors to complete the desired action. However, make sure that it feels natural and enjoyable to them at the same time. By adjusting various element sizes, color and position, you’re structuring your site in a way that visitors tend to be attracted to these essential elements first. Your site should precisely state what you offer and how to help your clients best. Doing so gives visitors a reason why should they hire you and seek out your services, and whether you have the right skills fit for their situation. You can list your services in your homepage, and provide additional information on a separate page. Content is still king at the end of the day. You want to set up a firm that’s competent, experienced, and compassionate resource for people who might need a lawyer in the future. So, an effective way to accomplish this is to create a highly informative and engaging content. 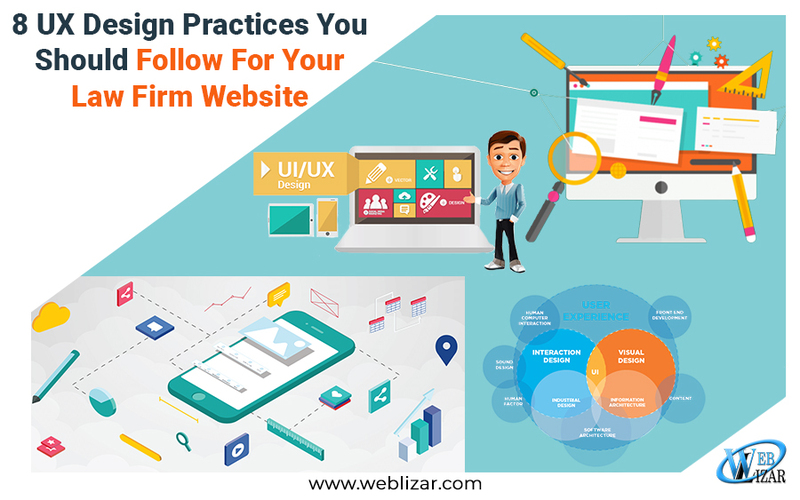 While most law firm websites have practice area pages that generally touch the most salient points in any specific area of law, you can use this to set yourself apart. Why not create a FAQ or Q&A for confusing or little-known areas of the law? Also, create a blog, and regularly come up with highly engaging and informative content for your readers. That way, readers will know that you’re in touch with your client base and is regularly updated with the legal world. It also helps to know the most common questions prospective clients will ask about the specific areas of the law. Filling your site’s pages with this kind of information shows that you know the law, and have the necessary experience under your belt. When people visit a law firm website, most of them have particular problems and want to find specific information that is highly relevant to their needs and easy to understand. That’s why more and more designers started to understand how infographics are valuable in a site. When information is placed on visual representations, it’s easier for the audience to discern useful pieces of information quickly. So, when you take the time to craft infographics, you’re providing your audience an easily digestible and engaging format to get the necessary information they need. Highly detailed infographics show prospects that you understand their specific pain points on a particular area of law. You must also have the relevant experience to address them appropriately. You need to include and simplify contact and consultation forms. If you can, ask only the information that’s required. It will avoid making your visitors feel overwhelmed, and leaving your site before they can fill the contact form. For instance, asking for their names, email addresses, and phone with a brief message is more than enough to make initial contact. Moreover, you can also consider using a booking form. It will allow prospects to schedule the date and time and decrease the total amount of time spent on scheduling via phone. As much as you can, try to keep the booking form as simple as possible, and ask only relevant information. People nowadays use their tablets and smartphones to search online. That’s why it’s crucial not to let visitors using mobile devices leave your site out of frustration. Maybe they’re frustrated because they have to scroll in different directions, or perhaps it took a long time for your site to load. Since your site needs to be responsive, then it has to resize according to the screen size that your device is viewed on. That way, visitors can access your device and read on your content without encountering any problems. Remember that highly responsive design is the one that fluidly changes and will respond to cater to any screen or device type. This aspect has been increasingly important because mobile devices are responsible for a high percentage of traffic. For instance, more people are even accessing Facebook via a mobile device than a desktop computer. This trend will continue through the years, and there’s no turning back. Even if you have a highly responsive site, having a slow loading site tend to drive visitors away. Aside from that, having a slow-loading site can have a significant impact on conversions. To avoid this from happening, make sure to test your site speed on Google Pagespeed Insights. Afterward, implement recommendations so that you can enhance your site’s page speed. User experience (UX), or the overall experience a user has in your website, is becoming crucial than ever if you’re marketing as a lawyer. UX has the power to improve your site’s performance and generate leads. Moreover, Google is now considering what users are doing in your site after they click on your link. Thus, if people have a good experience in your site (decreased bounce rates, number of pages visited, an increase of time spent on the site) Google will tend to rank those sites higher on search results. That’s why it’s the time to cement your firm to be the best in your area. Working with a company like Amazelaw that creates powerful attorney websites and marketing tools will help you achieve your goals and get the results you want, over time.